Arab-Israeli peace projects are projects to promote peace and understanding among Arabs and Israelis in different spheres. These are part of a broader attempt at a peace process between Palestinians and Israelis. Sponsors of such projects can be found both in Israel and Palestine. Israeli-Palestinian economic peace efforts are efforts to promote joint economic projects and efforts between Israelis and Palestinians as a pathway to reach peace between the two groups. They are based partially on official efforts and projects by the governments of Israel and the Palestinian Authority, and partially on private efforts by individual companies and business people who seek to promote various ventures which promote economic unity and collaboration between the two sides. This involves ongoing joint efforts by regional leaders to launch joint new industrial and economic projects, which will create new local businesses and job growth, and promote ongoing cooperation. It is an official joint effort of the Israeli, Palestinian and Jordanian governments to promote economic cooperation, and new business initiatives which can help both sides work together, and create a better diplomatic atmosphere and better economic conditions. It constitutes a co-existence project, as it is mainly designed to foster efforts in the private sector, once governments provide the initial investment and facilities. In early 2010, President Shimon Peres took an active and personal role in efforts to promote local business initiatives. Peres personally led a tour of top Israeli executives through the West Bank, and told them about many new Palestinian businesses which show much growth potential. One company highlighted by Peres was the New Generation Technology incubator, a joint Jewish-Arab effort founded in 2002 which encourages new ideas and projects in technology and biotechnology. One major idea is the creation of industrial parks where Israelis and Palestinians can work together. In 2011, according to Naftali Bennett, there were about 50 factories in the West Bank industrial region where Jews and Palestinians were working together. Joint economic cooperation between Israeli officials in Gilboa and Palestinian officials in Jenin has begun to have major results and benefits. In October 2009, a new project got underway promoting tourism and travel between the two areas. Major new business efforts and tourist attractions have been initiated in Jenin. The two regions are planning a joint industrial zone which would bridge the border. Palestinians would produce locally-made handicrafts and sell them through Gilboa to other regions of the world. Another possible project is a joint language center, where Israelis and Palestinians would teach each other Arabic and Hebrew, as well as aspects of their cultural heritage. The Valley of Peace initiative is an effort to promote economic cooperation between Israel, Jordan and the Palestinians. It was initially centered around efforts and joint projects in the Arava/Arabah Valley, along which runs the southern portion of the Israel - Jordan border. The idea for this project began in 2005, when Israel, Jordan and the Palestinian Authority asked the World Bank to analyze the feasibility of this idea. The Valley of Peace initiative began with a joint proposal in 2008 for a number of water-related initiatives. The study concluded in 2013, and an agreement was signed in 2013 by Israel, Jordan, and the Palestinian Authority to move ahead with the plan. In 2015, Israel and Jordan signed a major agreement to carry out the “Red-Dead” project, and to address the major regional problems of acute shortage of clean fresh water in Jordan, and the rapid contraction of the Dead Sea. A new desalination plant to be built near the Jordanian tourist resort of Aqaba would convert salt water from the Red Sea into fresh water for use in southern Israel and southern Jordan; each region would get eight billion to 13 billion gallons a year. In December 2015, Israel and Jordan formally released the technical plans to move ahead with this project. A new desalination plant to be built near the Jordanian tourist resort of Aqaba would convert salt water from the Red Sea into fresh water for use in southern Israel and southern Jordan; each region would get eight billion to 13 billion gallons a year. This process would produces about as much brine as a waste product; the brine would be piped more than 100 miles to help replenish the Dead Sea, already known for its high salt content. This would reinforce the status of the Dead Sea as an important economic resource to both nations, in multiple areas including tourism, industry and business. In May 2016, Israel and Jordan presented their plan for a Red Sea-Dead Sea canal to the World Bank and other potential investors. Sikkuy, public service organization founded in 1991, runs Ramadan tours for Jewish Israelis. The following are organizations or institutions which address and analyze policy issues in a wide range of areas, as well as major projects or efforts which are officially carried out by regional institutions, governments, or NGOs. One of ALLMEP's proposals is an independent International Fund for Israeli-Palestinian Peace to support and encourage efforts to build peace in the region. EcoPeace/Friends of the Earth Middle East is an organization which brings together environmental activists from Israel, Jordan and the Palestinian Territories, to work on common issues. One of FOEME's major efforts is a regional advocacy project to promote discussion and sharing of water resources. Formed in 2002, the Aix Group is an Israeli-Palestinian-international economic study team that conducts research on the economic dimension of the conflict. Areas of focus include Palestinian refugees, the construction of a territorial link between the Gaza Strip and the West Bank, development of the Jordan Valley, infrastructure cooperation, the economic status of Jerusalem. Givat Haviva is an education, research and documentation center, founded in 1949 by Ha'Kibbutz Ha'Arzi Federation; it is located in the northern Sharon Valley of Israel. According to its website " The mission of Givat Haviva today is to cope with the major issues that are on the agenda of Israeli society, and to foster educational initiatives, research and community work in the fields of peace, democracy, coexistence, tolerance and social solidarity." Givat Haviva sponsors the Jewish-Arab Center for Peace. "Established in 1963, the Jewish-Arab Center for Peace is one of the oldest and most prominent institutions in its field. The common bond of the dozens of projects conducted in the Center is the struggle for better relations between Arabs and Jews, better understanding of the essence of democracy and citizens' rights in Israel, and building bridges with our Arab neighbors." One of the Center's leading dialogue projects is Face to Face. Organizations which promote a variety of efforts and projects aimed at promoting co-existence and dialogue between the two sides. The Roots project organizes meetings between Israelis and Palestinians who live near each other in the West Bank in order to create dialogue. The project's outreach program includes monthly meetings between Israeli and Palestinian families, a women's group, work with school children, engaging local leaders, a summer camp, language learning, and cultural exchanges. In order to accommodate this wide variety of activities, a centrally-located site in the Gush Etzion area of the West Bank is used as a convenient meeting area. Ali Abu Awwad, whose brother died in the conflice, attends many meetings with local Jewish residents. One of the very first such meetings of his occurred in July 2014, between local Israeli and Palestinians within one part of the Etzion bloc in the West Bank. Rabbis for Human Rights is an Israeli human rights organization that describes itself as "the rabbinic voice of conscience in Israel, giving voice to the Jewish tradition of human rights". Their membership includes Reform, Orthodox, Conservative and Reconstructionist rabbis and students. According to their web site, the organization includes "over one hundred ordained rabbis and rabbinical students". The organization received the Niwano Peace Prize in 2006. RHR is best known for dispatching volunteers to act as human shields to protect the Palestinian olive harvest from vandalism and assault by settlers living on nearby land; every year, clashes are reported between settlers and Palestinian farmers. In 2008, the volunteer effort encompassed 40 villages. The effort was launched in 2002 when a Palestinian peace activist solicited RHR's help to protect olive pickers against attacks by settlers living near the village of Yanun. RHR opposes the construction of the Israeli West Bank barrier in any place where it entails the expropriation of Arab-owned land, the division of villages, or cutting farmers off from their fields. RHR achieved a major victory in 2006 when it won a lawsuit to prevent the division by the fence of the village of Sheikh Sa'ad. Formed in the fall of 2000, Ta'ayush (Arabic for "coexistence") is a grassroots movement of Arabs and Jews working to break down the walls of racism and segregation. It engages in daily actions of solidarity to end the Israeli occupation of the Palestinian territories and to achieve full civil equality for all Israeli citizens. The Coalition of Women for Peace (Hebrew: קואליציית נשים לשלום‎‎) is an umbrella organization of women's groups in Israel, established in November 2000. It describes itself as "a feminist organization against the occupation of Palestine and for a just peace.". CWP says that it is "committed to ending the occupation and creating a more just society, while enhancing women’s inclusion and participation in the public discourse". The groups that founded the Coalition of Women for Peace are Machsom Watch, Noga Feminist Journal, Women in Black, The Fifth Mother, TANDI, Bat Shalom, New Profile and NELED. The Coalition of Women for Peace came to an agreement on their principles for a solution of the Israeli-Palestinian conflict at a conference in Nazareth in November 2000. PC-FF was founded in 1994 by Yitzhak Frankenthal whose son Arik was killed by the Hamas. Today, PC-FF includes more than 500 members, half Israeli and half Palestinian. The members conduct dialogue sessions, give lectures, and engage in projects to support tolerance and reconciliation. In many ways the city of Jerusalem has been at the center of the conflict. The Israeli political movement Peace Now in 1994 has created an initiative called Ir Shalem, the goal of which is to build a peaceful equitable and inspiring future for this city, with Jewish and Arab citizens working together to find solutions based on equity and justice. This program brings together volunteer architects, planners, lawyers and other professionals to analyze problems, and offer solutions. Among other efforts, Ir Shalem is developing the first-ever planning model for East Jerusalem that will equitably meet the needs of the Palestinian community. Founded in 1993, Seeds of Peace brings together hundreds of emerging young leaders and educators from conflict regions at the Seeds of Peace Camp in Otisfield, Maine, USA, including thousands of Israeli, Palestinian, Jordanian, and Egyptian teens. The mission of Seeds of Peace is to inspire and cultivate new generations of leaders in communities divided by conflict. There are over 6,000 graduates of the Camp from 27 countries. Founded in 2004 by the charity's President, Richard Martin, Children of Peace receives personal support from world leaders including Pope Francis, American Vice-President Joe Biden, Quartet Envoy Tony Blair, British Prime Minister David Cameron, British Deputy Prime Minister Nick Clegg, British Labour Leader Ed Miliband, Bill Clinton, French President François Hollande, former Mayor of Hebron Khaled Osaily and Palestinian Envoy to the UK Dr Manuel Houssassian. Three UK parliamentarians from each major political party are Goodwill Ambassadors – Louise Ellman MP, Toby Ellwood MP and Ed Davey MP. In 2012, one of the charity’s Goodwill Ambassadors & Director of its Youth Ambassador Programme, Sally Becker carried the Olympic Flag into the stadium at the Opening Ceremony of London 2012, in Children of Peace's name. Currently there are 20 Youth Ambassadors, from Armenia, Israel, Palestine, Qatar, the UK and the United States. The charity’s approach is to build understanding between grassroots communities in the region. The charity works with more than 140 affiliate organisations in a unique Coalition of Peace in Gaza, Egypt, Israel, Jordan, Lebanon, Turkey and the West Bank (and in every continent). Specific efforts and specific projects, localized and otherwise, aimed at promoting co-existence and dialogue between the two sides. Olives of Peace is a joint Israeli-Palestinian business venture to sell olive oil. Through this project, Israelis and Palestinians have carried out joint training sessions and planning. It has also led to Palestinian oil production being enriched by Israeli components. It has produced olive oil which has been sold under the brand name "Olives of Peace." This is related to Peace Oil (UK) and Peace Oil (USA). The Israeli Jewish-Israeli Muslim Village of Neve Shalom – Wāħat as-Salām (NSWAS) means "Oasis of Peace" in Hebrew and Arabic. NSWAS provides a remarkable model of longterm coexistence. Formed in 1970 on land donated by the Roman Catholic Church, NSWAS sits between Jerusalem and Tel Aviv. They organize humanitarian projects, including providing medical assistance for Palestinians. They also run several schools, two for village and other area children, and they have a training facility called the School for Peace. The children's classes run from pre-school through Middle School and are all taught by both Muslims & Jews in their native languages. The School for Peace however is designed for adult Arabs and Jews from all over the area to learn about each other in controlled seminars run by trained Peace Facilitators. NSWAS has had many notable visitors over the years. Jimmy Carter, Hillary Clinton, and many others including Roger Waters (aka Pink Floyd) who has performed several benefit concerts in the small village urging Israel to "Tear Down the WALL!" An American branch recently incorporated under the name "American Friends of Neve Shalom" they are a non-profit 501(c)3 organization that raises funds in the US for NSWAS programs (similar support groups also exist in the EU, and elsewhere). Hamidrasha, a center for study and fellowship, works to address alienation, estrangement, and mutual ignorance between Jews and Arabs. Hamidrasha is establishing an inter-cultural Beit Midrash (Hebrew, "House of study"), which will serve as a basis for mutual personal and communal encounters, and for the study of cultural narratives and modern texts of both peoples. Jewish, Muslim and Christian men and women will engage in a true inter-cultural learning experience, with the goal of making a significant contribution to the ongoing dialogue between Jews and Arabs, and strengthening their reciprocal ties. In addition to olive oil, the main agricultural product of Palestinians in the West Bank, Green Action also sells za'atar, dibbes, organic fruit jam, herbal infusion and pressed olives. The olive oil is also sold in bulk worldwide including to Australia and the US. In the US, Olive Branch Enterprises of Seattle, Washington buys Green Action in bulk and bottles it under the Peace Oil label. From 2003-2007, the Jewish-Palestinian Living Room Dialogue Group partnered with Camp Tawonga over five-years to bring hundreds of adults and youth from 50 different towns in Palestine and Israel to successfully live and communicate together at the Palestinian-Jewish Family Peacemakers Camp—Oseh Shalom - Sanea al-Salam. Founded in 1998 by Israeli-Argentinian pianist and conductor Daniel Barenboim and Palestinian-American author Edward Said, the West-Eastern Divan (named after an anthology of poems by Johann Wolfgang von Goethe) promotes a cultural dialogue between Israelis and Arabs. A principal activity is an orchestra composed mostly of young Israeli and Arab musicians, who are demonstrating the potential for collaboration between the two cultures on the universal ideas that are communicated by great classical music. They have performed throughout the world. Barenboim has also made this point by going into Palestinian areas and giving piano recitals and master classes. A Tolerance Monument sculpted by Czesław Dźwigaj in collaboration with Michal Kubiak is situated on a hill marking the divide between Jewish Armon HaNetziv and Arab Jabel Mukaber, standing opposite the United Nations headquarters in Jerusalem in a park near Goldman Promenade. Unveiled in Jerusalem in 2008, it was funded by Polish businessman Aleksander Gudzowaty as a symbol to promote peace in the Israeli-Palestinian conflict. NeuroBridges is series of workshops, held in Europe, that began in 2014 aiming to bring together Arab and Israeli neuroscientists in order to promote scientific collaborations and develop personal relations that can help alleviate political distress. NeuroBridges was initiated by the Israeli neuroscientist Yonatan Loewenstein and the Egyptian neuroscientist Ahmed El Hady. The project is funded by the European Commission's European Instrument for Democracy and Human Rights (EIDHR) for Strengthening the role of civil society in promoting human rights and democratic reform, in supporting the peaceful conciliation of group interests and in consolidating political participation and representation (Transnational and regional actions). It is implemented by Future Worlds Center based in Cyprus with the collaboration of the Association for Progressive Education in Honor of Meir Ya'ari (YAARI) and the Palestinian Dialogue Center. The action aims to enhance the capacity in CSOs to actively promote Human Rights within their community, on a national as well as a trans-national level. It actively engages civil society actors from Israel and Palestine to collaborate on jointly developed community action projects that aim to foster mutual understanding, to promote and advocate for the implementation of Human Rights standards in the region. One of the aims is to bring together stakeholders from countries in the same region with the view of facilitating the peaceful conciliation and management of group interests and promoting solutions on divisive matters or controversial areas. MEET graduates have been accepted into top universities in the region and abroad, including the Massachusetts Institute of Technology. The skills and bonds of friendship forged by MEET students, combined with the students' natural talents, prepare them for a successful future of leadership, achievement, innovation, and cooperation. Aside from its partnership with MIT, MEET has been supported by the Hebrew University of Jerusalem (which has donated lab space for the summer sessions since MEET's inception), Al-Quds University, Sun Microsystems, Hewlett-Packard, and other national and international organizations, as well as many individual volunteers from around the world. The Institute for Circlework offered its latest series of circles in Israel during the Gaza war. TEC strives to build trust between Arabs and Jews, religious and secular through joint online courses and initiatives between college students and school children. The center established in 2003 by the heads of ICT in 3 teaching colleges is funded by the Mofet Institute Tel Aviv. The Arava Institute for Environmental Studies is an environmental studies and research program, located in Kibbutz Ketura, Israel. The Institute's mission is to advance cross-border environmental cooperation in the face of political conflict. Under the motto "nature knows no borders", the Arava Institute brings together Israelis, Palestinians, Jordanians and other international students and researchers to enable them to cooperatively solve the region's environmental challenges. In the Arava Institute's academic program, the participants study a variety of interdisciplinary courses ranging from sustainable agriculture, through waste management, to political ecology; as well as engage in a weekly peace-building leadership seminar that serves as a platform to address the Arab-Israeli conflict, and seeks to provide them with tools for open dialogue and conflict resolution. In addition, the Arava Institute holds a number of research centers that engage in transboundary scientific work in the fields of water management, sustainable agriculture, conservation, renewable energy, and sustainable development. According to their website "OneVoice is a global undertaking to: "Amplify the voice of moderates; Empower Palestinians and Israelis at the grass-roots level to seize back the agenda away from violent extremists; Achieve broad-based consensus on core issues, configuring a roadmap for conflict resolutions. OneVoice...was developed by over two hundred Palestinian, Israeli and international community leaders...dedicated to strengthen the voice of reason." Combatants for Peace (Hebrew: לוחמים לשלום‎‎) is an organization of Israelis and Palestinians who are veterans of armed conflict, and have concluded that there can be no solution through violence. The Israeli members served as combat soldiers in the Israel Defense Forces, while the Palestinian members "were involved in acts of violence in the name of Palestinian liberation." The organization, founded in 2005, supports a two-state solution to the conflict. A statement on their website says, "We call for the establishment of a Palestinian State, alongside the State of Israel. The two states can exist in peace and security beside each other." Israel Palestinian Cooperative for Economic Expansion (aka; International Peace Cooperative for Economic Expansion; Israel Palestine Cooperative for Economic Expansion) (IPCEE) is a small 501(C)(3) founded in the United States and based in Connecticut in 2011, believes that an essential avenue for helping end the Israeli-Palestinian conflict is to push forward the spread of economic prosperity and improved healthcare for the Palestinians living in the West Bank. Strengthening essential infrastructure and institutional capacity within the West Bank facilitates prosperity and self-reliance—ultimately leading toward a healthy separation and inter-independence between Palestinians and Israelis. According to the organizations President/CEO, "The ultimate goal for the IPCEE Healthcare Initiative known as Peace through Medicine, contributes to the realization of an independent Palestinian State, living peacefully side-by-side with the State of Israel"
IPCEE may provide grants to both public and private schools and universities in Israel and the West Bank and may make grants directly to the Israeli government and the Palestinian National Authority to fund the construction of new schools. IPCEE plans on providing food for schools by making grants to the Ministries of Education and the Ministries of Health (or their equivalents) in the Israeli government and the Palestinian National Authority. Additionally, IPCEE may make grants to other governmental agencies in Israel or to the Palestinian National Authority to provide technical/electronic equipment (computers, software, broadband internet services, etc. ), playground equipment, educational materials (books, textbooks, workbooks, etc. ), classroom furniture (desks, chairs, chalkboards, etc. ), and basic school supplies (notebooks, binders, pens and pencils, etc.) Governmental grantees may also use grant funds to hire teachers, counselors and/or school administrators. IPCEE may provide grants to existing hospitals and health clinics in Israel and the West Bank and may make grants directly to the Israeli government and the Palestinian National Authority to fund the construction of new hospitals and health clinics. Grant funds might also be used to hire medical staff (doctors, nurses, specialists, etc.) and/or hospital personnel (staff, administrators, etc.). IPCEE may provide grants to the Israeli government and the Palestinian National Authority to fund the construction of new community centers such as libraries, women’s centers, youth centers and learning/language centers. These community centers will offer a variety of resources and opportunities for economically disadvantaged locals, including classes, lectures, language and literacy programs, and vocational training. Vocational trainings, for example, will include professional training workshops to teach locals the fundamentals of various trades such as carpentry, blacksmithing, plumbing, traditional and modern baking techniques, food service, computer science, textiles and sewing, ceramics, photography, newspaper production, and theater. These community centers will also provide public access to useful facilities such as conference rooms, auditoriums, media libraries and computer labs. Grants would be made to governmental agencies as well as other public institutions in Israel and the West Bank. JIPF's platform include demands for a full Israeli withdrawal, including the evacuation of the Jewish civilian population, from all territories that came under Israeli military control as a result of the Six-Day War, the establishment of a Palestinian Arab state with East Jerusalem as capital and a "solution" to the issue of the Palestinian refugees. In 1986 the AJC publicly condemned the murder by bomb attack of Alex Odeh (in Oct. 1985), a leader of the American-Arab Anti-Discrimination Committee in Santa Ana, California. The AJC had a meeting with the Federal Bureau of Investigation director William Webster about this incident; they urged action to identify and punish those responsible for anti-Arab bigotry. In 1986 the AJC submitted testimony to the United States House of Representatives, Subcommittee on Criminal Justice, on the topic of violence and discrimination towards Arab-Americans. In 1993 the AJC sponsored the first national conference on "Muslims and Jews in North America: Past, Present and Future" with the Institute for Islamic-Judaic Studies at University of Denver in October. In 1994 they sponsored the second such conference. The third conference had to be canceled, when the AJC could not found Muslim partners who were willing to publicly condemn the current wave of terrorist attacks on Israel. ↑ A valley of economic harmony' by Yaakov Lappin, jpost.com, 1/17/08. ↑ Your guide today is... Shimon Peres Archived September 16, 2011, at the Wayback Machine., by Ron Friedman, Jerusalem Post, Jan 13, 2010. ↑ New Generation Technology (NGT) Company Profile. ↑ Arab-Jewish industrial parks: The last chance for economic equality Archived October 5, 2016, at the Wayback Machine. July 23, 2013, 972mag.com. ↑ Do West Bank Realities Defy Perceptions? Archived March 7, 2016, at the Wayback Machine., by Gary Rosenblatt, Jewish Week, Tuesday, January 25, 2011. ↑ Jenin now open to Arab-Israeli and foreign tourists, By RON FRIEDMAN, jpost.com, 10/9/09. ↑ Mutually assured prosperity Archived September 16, 2011, at the Wayback Machine., By RON FRIEDMAN, jpost.com, 10/15/09. 1 2 3 4 Israel, Jordan unveil $800m joint plan for ‘Red-Dead’ canal: As well as rejuvenating the rapidly diminishing Dead Sea, the canal will bring drinking water to both countries Archived April 2, 2016, at the Wayback Machine., Times of Israel, December 1, 2015. ↑ Dramatic new support for Red-Dead plan Archived January 4, 2016, at the Wayback Machine. By JUDY SIEGEL-ITZKOVICH, Jerusalem Post, May 16, 2008. 1 2 Israel Desalinization Technology Leads to “Historic” Agreement with Jordan Archived October 27, 2016, at the Wayback Machine., israelideas.org, April 22, 2015. ↑ Jordanians Host Red Sea-Dead Sea Canal Conference. The Project is estimated to cost $400 million. Archived October 8, 2016, at the Wayback Machine. haaretz, May 10, 2016. ↑ Israeli-Palestinian Chamber of Commerce Archived December 14, 2010, at the Wayback Machine., Peres Center for Peace. ↑ Israeli-Palestinian Chamber of Commerce Archived October 17, 2016, at the Wayback Machine. website. ↑ Sikkuy website Archived April 26, 2016, at the Wayback Machine. ↑ Shared Jewish–Arab Regional Tourism (SRT): A Sikkuy Initiative Archived September 18, 2016, at the Wayback Machine., official website. ↑ ALLMEP Grows to Over 70 Organizations news, ALLMEP news, Thursday, 29 October 2009. Archived June 13, 2010, at the Wayback Machine. ↑ 20009 ALLMEP Summit Archived September 7, 2010, at the Wayback Machine., group website. ↑ Mejdi website; Our Philosophy Archived January 5, 2010, at the Wayback Machine., accessed 12/25/09. 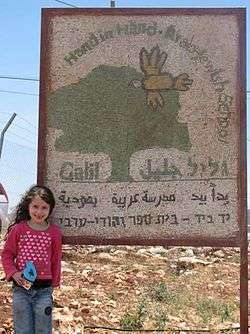 ↑ To Fatah and back, By LAUREN GELFOND FELDINGER, jpost.com, Nov 19, 2009. ↑ Dwoskin, Elizabeth (August 11, 2011). "Trying to Put a Price on Middle East Peace". Bloomberg Businessweek. ↑ "Archived copy". Archived from the original on 2015-07-05. Retrieved 2007-02-18. ↑ "Archived copy". Archived from the original on 2015-03-17. Retrieved 2015-03-05. ↑ "Archived copy". Archived from the original on 2015-04-03. Retrieved 2015-03-05. ↑ "Hanan Schlesinger - The Blogs - The Times of Israel". The Times of Israel. ↑ "Home". Rabbis Without Borders. ↑ "Friends of Roots". Friends of Roots. ↑ Palestinian Ali Abu Awwad Speaks About Nonviolent Resistance in Israel/Palestine, By Lily Tyson, March 5, 2015. ↑ About Roots Archived May 5, 2016, at the Wayback Machine., group website. ↑ "Interview with Ali Abu Awwad". Just Vision. 12 June 2005. Retrieved 16 July 2012. ↑ In a settler’s living room, a Palestinian reaches out: Activist Ali Abu Awwad, who lost a brother to the conflict, uses nonviolence to challenge the prejudices of his Arab and Jewish neighbors. Archived August 27, 2016, at the Wayback Machine. Times of Israel, 3/4/15. ↑ Settlers and Palestinians break their fast together. At the Etzion bloc intersection, an effort to find a joint dialogue over chicken and mejadra. Archived April 4, 2016, at the Wayback Machine. Times of Israel, 7/16/14. 1 2 Rabbis for Human Rights home page Archived October 14, 2016, at the Wayback Machine., accessed 27 April 2011. ↑ Lazaroff, Tovah (10 October 2011). "Settlers, Palestinian farmers collide in Itamar". The Jerusalem Post. Retrieved 20 January 2012. ↑ "Settlers clash with rabbis guarding Palestinian olive harvest near Hebron". Reuters. 3 October 2008. Retrieved 20 January 2012. ↑ McGreal, Chris (25 March 2005). "The rabbi who pricks Israel's conscience: Zionism is moral, not military, says activist convicted of blocking West Bank bulldozers". The Guardian. Retrieved 17 January 2012. ↑ Israel Today, May 2006. 1 2 "About CWP". Coalition of Women for Peace. Retrieved 12 May 2011. ↑ CWP History Archived October 14, 2014, at the Wayback Machine. ↑ Parents Circle Newsletter Archived July 17, 2011, at the Wayback Machine. ↑ Anna Lindh Euro-Mediterranean Foundation for the Dialogue Between Cultures Archived April 18, 2012, at the Wayback Machine. ↑ "Archived copy". Archived from the original on 2004-12-17. Retrieved 2003-01-05. ↑ “Israel-Palestinian cooperation a decision that makes sense from the economic point of view”, Konrad-Adenauer-Stiftung (KAS) a political foundations in Germany for Mideast dialogue and cooperation, Oct. 26, 2008. ↑ New joint Israeli-Palestinian olive oil brand launched Archived March 3, 2016, at the Wayback Machine., Ynet news, Published: 03.20.07. ↑ Fair Trade In Israel Archived May 5, 2011, at the Wayback Machine., By KARIN KLOOSTERMAN, Treehugger.com, 6/7/06. ↑ Peacemaker Camp 2007, website Archived April 22, 2016, at the Wayback Machine. ↑ "Archived copy". Archived from the original on 2014-01-08. Retrieved 2013-05-07. , by Michael Rogosin, March 3rd 2013. ↑ KERSHNER, Isabel (2008-10-17). "Symbol of Peace Stands at Divide Between Troubled Jerusalem's East and West". New York Times. Retrieved 2008-10-18. ↑ Kardinal, Mareike (2014-07-30). "NeuroBridges—Bridging the gap between Arab, Israeli, and German neuroscientists". idw. ↑ Evenhaim, Adam (2015-09-09). "Egyptian and Israeli neuroscientist striving for peace". idw. ↑ Act Beyond Borders Website Archived October 1, 2016, at the Wayback Machine. ↑ Greg Frost, News Office (19 September 2007). "Unique Middle East program rooted at MIT bears fruit". MIT News. ↑ Partial list of MEET's supporters Archived July 20, 2011, at the Wayback Machine. ↑ MEET's Website Archived August 28, 2016, at the Wayback Machine. ↑ Eli Ashkenazi, "The Jew comes to learn from the Arab - and it works," Ha'aretz English Edition (Israel), September 21, 2005. Archived February 20, 2007, at the Wayback Machine. ↑ web site of the Institute for Circlework Archived October 9, 2016, at the Wayback Machine. ↑ "In The Middle East, Muslims And Jews Work In Unison To Care For The Environment". The Huffington Post. 2015-04-21. Retrieved 2016-06-01. ↑ "Joining hands to build a green future in the MidEast". Israel21c. Retrieved 2016-06-01. ↑ "2,000-Year-Old Seed Sprouts, Sapling Is Thriving". news.nationalgeographic.com. 2005-11-22. Retrieved 2016-06-01. ↑ Rinat, Zafrir (2015-11-23). "Evrona Reserve's Ecology in Danger Due to Oil Spill's Damage to Trees". Haaretz. Retrieved 2016-06-01. ↑ Glanz, James; Nazzal, Rami (2016-05-14). "Solar Project Pairs Muslims and Jews to Aid West Bank Farmers". The New York Times. ISSN 0362-4331. Retrieved 2016-06-01. ↑ "Israel Arava Institute addresses water shortages with UMD students". The Diamondback. Retrieved 2016-06-01. ↑ "Combatants for Peace - There is another way!". ↑ The Times, June 28, 2007 "Archived copy". Archived from the original on 2011-08-31. Retrieved 2007-07-23. First Palestinian-Israeli arbitration center to run in 2012, jpost.com 05/02/2011. 12th Session of the Palestinian – Israeli Young Business Leaders Forum.